My freshmen year of high school, I thought I would go out for basketball. I sort of tried to get in shape before hand. I had played basketball in middle school, I was mildly successful. Being tall, I was expected to play post and rebound balls. I was okay, but not great. I went to 2 days of practice…maybe not even that. (I can’t really remember.) I was not good at all, even at the practice. I was slow, my knees hurt, I had no dribbling coordination. I was not cut out for it. …..But I didn’t want to quit, because we didn’t quit things in my family. I had the hardest time telling my dad, who put a lot of stock in sports. I didn’t love it enough to put myself through grueling practices and most likely not play in any game. But I quit anyway….I felt horrible. I felt like a quitter, a giver-upper. I felt lame and worthless. Even though I know it was the right decision at the time, I still hated quitting something. I hated that feeling. It felt like failure. The enemy uses failure in horrible ways in our hearts. He likes to use it to tell us that we are worthless, nothing, scum, and that God doesn’t love us. He tells a whole lot of lies through that feeling of failure. For many years, I lived under that feeling of failure, even after finishing a lot of other things. Quitting sports has hung over my head, until now. Now, years later, I am experiencing the opposite….I didn’t quit, I kept going and I finished what I started. I was just crazy enough to run a Half Marathon a 3rd time. Yep, I am officially half crazy. This time it was a little more fun. I didn’t want to die until mile 10, but I think that was because I started too fast and I didn’t pace myself. There is something about running a race, there is excitement and joy for the people who are doing this for the first time or are overcoming a lot of things while doing this. There is something about being cheered on for a physical accomplishment. There is something amazing about witnessing human potential. There is something incredible about pushing yourself further when you think you have nothing left. There is something about coming up the final hill and hearing people cheer whether they know you or not! 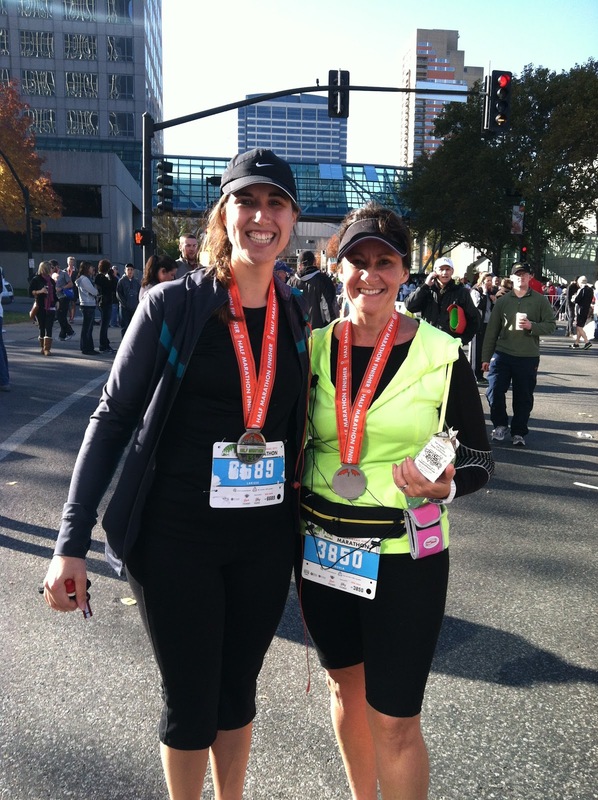 My trainer and Angie after finishing 13.1 miles! There is something that is so addictive….might have to keep doing it! What is something that you want to finish? Where is an area that you feel like a quitter? This spoke to my heart in so many ways! Thanks, friend. Perfect read before my race on Sat. And, guess what, I'm going to use the winter to try to up my mileage, so I can try for a 10K in the Spring! Ahhhhh!